"We are sailing in the largest, the most powerful battleship afloat, superior to anything in the British navy. We are faster, we are unsinkable, and we are Germans!" If there's one offense of hubris that the gods seem utterly determined to punish, that one must be calling any ship "unsinkable." As the Titanic proved, assigning that adjective to a watercraft is just asking for trouble. So it was with the renowned Bismarck, which was trumpeted by the Nazi military machine as the greatest ship ever built, with fearsome firepower and a threat to Britain's survival during World War II, for it was expressly designed to destroy British troop convoys as the English attempted to shore up such far-flung theaters of the war as Crete and Malta. Thus the destruction of that ship was both a military and a symbolic necessity in the dark early days of the war. Captain Jonathan Shepard (Kenneth More) is a by-the-book naval officer assigned to the Admiralty in London after seeing plenty of action by the opening of the film in May of 1941. At first making waves by not putting up with informalities and lack of discipline, he uses his knowledge gained through fighting the German navy to predict the actions of the Bismarck, her captain, Lindemann (Carl Mohner), and Admiral Lutjens (Karel Stepanek), who is using the ship's launch as his own personal badge of honor in the German military apparatus. When the Bismarck blows up the HMS Hood, grim determination sets in with only one goal left to the British: sink the Bismarck. Even though the conclusion is foregone (at least to anyone with a passing knowledge of World War II), one might think that there would be difficulty generating suspense in a film like this. The first half does tend to be rather talky and will lose the interest of many viewers. However, the last half hour in particular (once the Hood has been sunk) does a very nice job of creating tension as the Bismarck is lost in a pea soup fog and there seems to be no way for the remaining British fleet to catch the enemy ship before she's free to roam the north Atlantic. The staging tends to be workmanlike at best. The ships tend to be indistinguishable in the fog and the rain, making the naval battles themselves quite difficult to follow at times, particularly if one isn't already familiar with the story of this conflict. 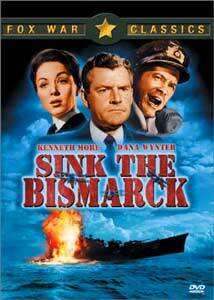 The film is loosely based upon a book by noted seafaring novelist C.S. Forester, better known for nautical yarns of a much earlier period. As historical reportage the picture falls a bit flat, though it is aided by famed journalist Edward R. Murrow (as himself), recreating his wartime broadcasts to lend an air of authenticity. The character of Shepard is, as the closing credits note, a complete fabrication, also saddled with a modest little romance with Second Officer Anne Davis (Dana Wynter). Despite her prominent billing and featuring in the cover art, she's barely present long enough to register on the screen; she's mostly there just to lurk in the background and look understanding as Shepard grieves over his lost son. The story pulls out all the stops with that subplot, very nearly careening into the maudlin. Perhaps most entertaining are the German officers; Stepanek in particular is a picture of personal ambition and hubris. While his and Lindemann's terming the ship unsinkable is probably not directly responsible for its fate, certainly the Nazi attitude of reliance on and pride in its superior technology renders a lesson that should not be forgotten. Unfortunately, the hit song by Johnny Horton of the same name is not featured in the film at all, though it does surface in the trailer. Image Transfer Review: The black & white CinemaScope picture generally looks quite fine. Even though there are extremely difficult visuals (fog, rain, water and smoke) the picture comes through quite well. This is aided by the use of an RSDL disc for a comparatively brief film, maxing out the bit rates. The source print features minor speckling, with abundant grain that is also well-rendered, avoiding the sparkly sensation that often afflicts such grainy films. The original battle footage fits in rather well (no doubt why this was made in black & white). Black levels are substantial, with decent detail and texture quality. Audio Transfer Review: The English track is provided in both 2.0 stereo and 2.0 mono. The stereo track has no significant surround information, though the mains do feature some moderate stereo separation. Both the stereo and mono tracks are extremely clean, with clear dialogue and full-sounding music. Don't expect deep bass rumblings from the battleship guns, though. Low bass, if it ever existed on the track, is largely absent here. Not flashy, but gets the job done. Extras Review: Other than an assortment of trailers, the most notable extra is a brief original Fox Movietone newsreel of the sinking of the Bismarck (2m:22s). It's interesting to compare this to the film's version of the same events. The feature is supported by the English trailer and the Spanish version (identical, except for subtitles and a Spanish voiceover artist). Anamorphic widescreen is the order of the day for all trailers except 13 Rue Madeleine and The Desert Fox, which are full frame. An occasionally tense but mostly overlong and difficult to follow naval extravaganza, with a few interesting extras and sporting a very good transfer.